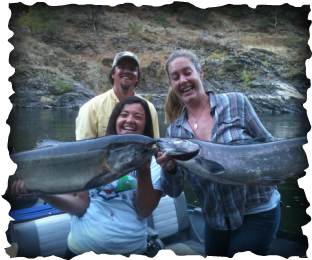 Running deep and strong through southern Oregon's Siskiyou mountains , the Rogue river features exceptional fishing, abundant wildlife, incredible scenery and rich history. It is this combination of characteristics that inspired Congress in 1967 to include the Rogue as part of the original Wild and Scenic Rivers Act. Still, here over forty years later the fishing on the Rogue remains unsurpassed. Recognized as salmon and steelhead paradise, the Rogue provides fishermen and women with idyllic pools and quiet fishing holes that teem with fish journeying upriver from the nearby Pacific Ocean. Steelhead in the fall range from one to three feet long and weigh up to fifteen pounds. Chinook (king) salmon up to 40 pounds are also caught. And, the smaller silver (coho) salmon up to 12 pounds ply these waters. This is offered as a three or four day trip. Each night is spent in rustic fishing lodges that provide comfortable accommodations as well as delicious dinners and breakfast. We have lunches on the rivers edge which is based around the catch of the day! WINTER STEELHEAD TRIPS ARE AVAILABLE ON THE ROGUE CANYON FEBRUARY THROUGH MARCH. We are an authorized permittee of the Bureau of Land Management and an authorized permittee of the USFS, located in the Rogue River, Siskiyou National Forest, Gold Beach Ranger District. Trips begin every 5th day from September 10th through early November. 4 day Cost: $2050.00 p.p. Includes all lodging and meals. Add 5% Federal use fees/taxes. 3 day Cost: $1750.00 p.p. Stay in river lodges while on the trip. Three day trips are two nights on the river/ Four day trips are three nights. What’s Included: Driftboat and guide, rods & reels, lodging, meals and transportation to and from river. Not Included: Oregon fishing license, adult beverages, guide gratuity, Government access fees. CALL 541.231.9993 FOR MORE INFORMATION OR TO BOOK YOUR TRIP.